Tired of reading reviews on wussy EDC knives? Need something capable of holding off an army of blood thirsty Persians? Consider the Cold Steel Spartan. Yeah, I enjoy reviewing EDC blades just as much as the next guy, but sometimes I need a little more. Thankfully, Cold Steel is around to supply me with all kinds of testosterone laden products. Lets take a look at this ridiculously awesome hard use folding knife. Let me start off by saying this is a heavy knife. Cold Steel claims it weighs 7.5 ounces. For the amount of knife you are getting I think it’s reasonable, but lets not mince around here; it’s still heavy. Naturally I made a point to carry the Spartan to get an idea as to how it handles. If you are wearing a decent belt it actually carried pretty well for me in a roomy pair of shorts. That said, for most this certainly isn’t an EDC knife. Ultimately I want to call this a “hard use” knife and leave you to decide the specific application. You could carry it as a tactical knife, and you could also carry it as an outdoors knife. Honestly I think the Spartan would also make a great folding camp knife as it is more than capable of light chopping, batoning, and other tasks normally associated with a fixed blade. The shape of the blade is also really good for food prep (tons of belly, wicked slicer). And of course this could be a cool collectable as well. For some this will be a serious tool and for others this is just a cool knife to have in the collection. The Spartan has a 4.5″ blade, an overall length of 10.5″ and a weight of 7.5 ounces. The blade on this thing is impressive. The unique shape is designed after the ancient Greek “Kopis” sword, but in more modern terms it’s a drop point with a large recurve. This recurve offers incredible slicing power and as a defensive tool, well, lets just say I wouldn’t want to be cut with a Cold Steel Spartan. As you draw the blade over your cutting surface, the recurve grabs material and shears it with amazing precision. The only downside to a knife with such a substantial recurve is that it’s difficult to sharpen. I ended up giving sharpening a try with my Spyderco Sharpmaker, and I managed to restore the factory hair shaving edge with some work. So sharpening the Spartan certainly isn’t impossible; especially if you have sharpening rods. Note that if you are going to carry the knife on extended outings, say, in some sort of military capacity, it could be tough to sharpen in the field. And as a warning, seriously, be very careful with this blade. I inadvertently cut through my shirt and a cleaning cloth on multiple occasions when I tried to clean this blade up a bit – this is a first. The big recurve makes it behave a little differently from a more ‘normal’ knife. The blade on this knife has a reinforced tip and a high hollow grind that begins about 3/4 of the way up the blade. The tip is great for penetration and the hollow grind is excellent for slicing. The Spartan has very versatile blade geometry and it’s a great performer. The knife has been given a beautiful blasted finish and the Cold Steel and “Spartan” logos have been nicely etched into the knife. The blade on the Spartan is made of AUS 8A stainless steel. This is good mid range steel, and when you consider the price of the knife (around $50) this was very satisfactory. I like AUS 8A on my hard use knives because it’s a very tough steel that resists chipping. It does tend to lose it’s edge a little faster than harder premium steels, but it’s an easy steel to sharpen – a must with the challenging recurve. The handle scales on the Spartan are made of grivory, a kind of high impact plastic. The grivory handle scales are over full stainless steel liners. No doubt, this is where the chunky Spartan gets some of its weight from. I would have loved to have seen these liners milled out, but I’m happy to see how flush they are in the scales and how strong this knife is. Even if you milled the liners out I think you would still have a very heavy knife – it’s just built tough. Everything has been bolted together so you can take this knife apart as needed. The pommel is big and would serve as a very effective impact tool. The ergonomics on the Spartan are really unique. One glance at the handle and you can tell something different is going on. First of all, the handle wraps around your hand. The textured scales have been given a tiger striped pattern that is both attractive and comfortable. When you grip the Spartan your hand feels secure. This is not a knife that will slip away easily. Potential negatives are that there is nothing in the way of jimping, and the thumb plate feels a little awkward when choking up. That said, I really like the ergonomics as a whole. This is a knife designed to cut through anything you put in front of it and the handle keeps the knife in your hand – it’s simple but effective. All in all, the pocket clip on the Spartan is excellent. First of all you get two pocket clips; one for left hand carry and one for right hand carry. Cold Steel does this on a lot of their knives and I love it. The clip is black and has been given a very durable semi-gloss coating. The clip is also designed to ride low in the pocket – this is good for carry but can be awkward when trying to use the wave feature of the knife. In some ways I would prefer a clip placement that didn’t put the knife so deep in the pocket. The Spartan uses a large thumb plate to deploy the knife. You can use this plate like a thumb stud, or you can use this plate to wave the knife open off your pocket like an Emerson folder. The spring on the Spartan is pretty strong so flipping the knife open with your thumb is not that easy, especially because the knife is big and the thumb plate needs to travel a good distance to fully engage. For that reason I really like the wave. It pops the Spartan open with amazing speed. The Cold Steel Spartan makes use of the now legendary Tri-Ad lock. Designed by Andrew Demko, this lock is probably the strongest locking mechanism in existence. There are videos of people absolutely wailing on this knife and the lock holds up. Once you get the Spartan in your hand it all makes sense. Lock up feels like a bear trap engaging – the “snap” the knife makes is incredible. It’s no wonder people have used this like a fixed blade. Disengaging the lock took some effort. For reference, I’m 6’2″ 240 lbs. Over the years I have spent a fair amount of time in the gym and have developed pretty decent hand and grip strength. I’ll tell you, I have trouble unlocking this knife if I don’t have a good grip on it. It’s a very very strong spring on a very sturdy design. For many people I think the lock will take some practice. I might even suggest Cold Steel puts a weaker spring on there, but I wouldn’t want to look like a total wuss. I can’t help but feel like I’m having difficulty adequately describing the knife. Perhaps I wasn’t prepared for the tank that arrived in the Cold Steel box, but this big blade totally took me by surprise. I think Cold Steel once again raised the bar with affordable toughness. It is very well built and the Tri-ad lock is the toughest lock out there. 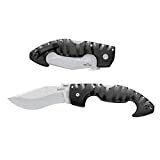 For the money I do not think you will be able to find a bigger and stronger folding knife. I was also very impressed by the Spartan’s build quality. This knife was made in Taiwan and they really paid a lot of attention to detail. The blade is centered, the grinds are even, and finishing is very nice. Everything is smooth and lines up. It’s a well thought out knife that has been expertly executed. When it comes to negative aspects of the knife, the only thing I can really say is that the blade is somewhat difficult to sharpen and I might prefer a carry that isn’t so deep. These are minor issues and I generally think the Spartan is an awesome blade. If you want something big and bomb proof, and don’t particularly care about things like weight and local carry laws (I’m joking but definitely check your local laws before carrying in public), check out the Cold Steel Spartan. I don’t think you will be disappointed with the knife but you have been warned – it’s big. If you are interested in purchasing a Cold Steel Spartan, then I recommend purchasing it at Amazon or BladeHQ. Purchasing things through any of the links on this website helps support BladeReviews.com and will help to keep the reviews coming. Any support is greatly appreciated. Thank you very much. LOL…I ordered this knife yesterday and popped for Saurday delivery and it arrived about 90 minutes ago. Just happened to be doing my morning internet ritual and as usual checked your site. What do I see? A write-up of this very knife! As usual a very good job…enjoy reading your stuff. I will say that I was concerned about one hand opening and closing of this knife due to so much I have read about its size and the massive parts used in the lock. I was pleasantly surprised to find that I can easily open it one handed and close it as well. It is more difficult to close when compared to most lock-backs…the Spyderco Endura or my Police model for instance. You are correct in that you do need a good grip for one hand closing, but is not too bad, just a little different than so many other knives out there. Keep the reviews coming, good stuff! Very cool man – great minds must think alike. 😉 Glad you had no issues w/ deploying or unlocking the knife – it’s a heavily built knife and takes some practice to get good with it (especially unlocking). Thanks for stopping by man, I look forward to reading your review. Not sure, I feel comfortable considering AUS8 being ‘hard use.’ But then again I don’t consider many stainless steels to be that. 4.5″ is right about the limit on what I believe should be a max length for most stainless. This looks very kukrish, and I think some folks will try to use it as such. Stainless to me is a cutter. Not a chopper. Both the steel and the folding pivot generally lack the strength. It is a very neat blade to be certain. However, to be more than just need neat, I’d like to see something like s30v in the steel with some serious beefing to the pivot. RK, you would be surprised how strong this thing is – you really gotta hold one of these suckers. AUS8 is tough stuff and it’s propensity to avoid chipping is why I think it’s a decent choice. I think something like 1095 would have been even better here, that’s a good point and I think I’ll add that to the review. Would I use this as a dedicated chopper? No – but it’s been shown to chop and baton, if it was all I had I’d use it. I’ll grant you that. Now, if they did a San Mai III… Stainless laminates are a whole other story. Actually, that couldn’t be too much more expensive. Seriously, I’d lay down an extra $40 to $50 to get a knife that looks as good as this in such a tough material. As for AUS8, its rather well documented about SOG and Cold Steel’s AUS8 ‘combat’ knives having breakage. But then again, most of those are past 6 inches, which is past my comfort zone for all but the most modern stainless. If the Spartan was a bit under 4″, I don’t think I’d be so concerned. I do not entirely trust my VG10 5″ Spec-Elite really. Of course, tool steels have to be kept up so much more being close to the body. It doesn’t make much sense to use anything but stainless for a pocket-clip knife. Thanks for the review, Dan. Helpful and accurate as always. My pleasure Justin! Glad to hear the review was helpful, thanks so much for stopping by. The lock is much easier to disengage if you put the force exactly on the rear edge of the bar and push in a 45 degree angle to the belly of the handle. Like most of the locks with steel-on-steel friction, the Tri-Ad in Spartans benefit greatly from a SMT2 treatment: I don’t know if this oil is good or bad for engines, but it does a fantastic work in locks. Thanks for the extremely insightful comment! I have noticed asymmetries to the edge of a lot of production knives. I guess when they mass produce a knife like that it can be difficult to keep track of all the details like that. If they do it on purpose well, that seems mysterious to me too! 🙂 You are right, it’s not impossible to sharpen this knife with a rod, I’ve managed to do a decent job of that on my Spartan – but it takes practice (and time!). You are also right about that bead blasted finish, it’s extremely porous and has a lot of surface area for the steel to oxidize. For that reason I’m not a huge fan of sandblasted blades. And you are also right about hitting the lock in the right place to disengage it. You gotta have a good grip and steady hand to consistently disengage the lock with ease (at least until it really breaks in), but it’s not impossible… not by a long shot. Congrats, Rick! I hope you enjoy it!